Green living offers believes in eco travel and adventure that improve well-being and enhances an active life. Book your vacation or next travel outing from our eco listings! With so much to explore it is impossible to be bored in Cancun, take a look at these amazing tours that will have you coming back for more. Even more options for your vacation to the Caribbean Sea. Parks and Tours in Cancun and Riviera Maya that every family can enjoy. Even more to do in Cancun, guided tours and events for the whole family. So much to do and so little time, let the outdoors bring you the time of your life. 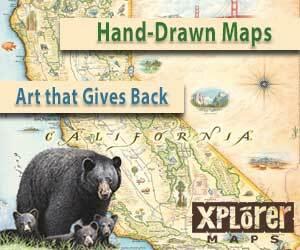 Xplorer Maps has large variety of hand crafted maps that are more than just beautiful, they are accurate as well. Great as gifts or framed as artwork these maps are intricate and inspired by the areas they depict. Hiking, kayaking, fishing and rock climbing all next to the Great Bear Rainforest in British Columbia. In the evening dine on food locally sourced and unwind with a glass of wine. Located only 20 miles away from Mount.Â Kiliminjaro and geared towards not only wildlife but also helpingÂ preserve the Maasai culture. LEED Platinum certified and beautifully designed, this hotel/spa located in Napa Valley will leave you feeling refreshed and ready to get up and go! With organic food delivered to you every morning and “pick me” signs on the trees that are ripe for the taking, a truly unique experience that satisfies your appetite on St. Kitts. A pleasant mix of environmental awarenessÂ and refinement, The Greenhouse is one of the top eco hotels in the UK for a reason. Green is a understatement when it comes to this resort/spa, with their ownÂ biomass-fueled electricity plant along with the more well known green technology they are a cut above the rest. In Australia andÂ a hour’s drive south of Broome you will come across the Ramada Eco Beach Resort, with lodging that is geared to have the smallest impact possible on the native surroundings and stunning views of the Indian Ocean. China might not be the first place you think of when you hear environmentally friendly but it doesn’t mean there aren’t groups trying to make a difference. Â URBN Hotel, located in Shanghai, is the countries first carbonÂ neutral hotel. Don’t mind getting your hands dirty? Urnatur can be reached by a 3 hour drive fromÂ Stockholm and is a great choice for those who want a unique experience on their vacation. Lapa Rios Eco Lodge offers somethingÂ for wildlife, nature and beach lovers. BoastingÂ 17 private bungalows and set in a private nature reserve spread over 1,000 acres be prepared to unwind in one of the most beautiful environments Costa Rica has to offer. The Kasbah, located in the Toubkal National Park, offers views of north Africa rarely seen. Â Trek through the local wilderness and explore theÂ High Atlas Mountains of Morocco. You will find a coral reef sanctuary, forest reserve, and historical monuments on your trip to Chumbe Island Coral Park. Â Stay at one of theirÂ 7 eco-bungalows and enjoy wildlife that onlyÂ Tanzania has to offer. Chiang Rai is far removed from the clutter of modern living. Enjoy the use of their on site spa, horseback riding through the countryside, or tour local historical monuments. Focused on both sustainability and helping the local community, The Lodge at Chaa Creek offers your traditional spa/vacation packages as well asÂ The Blue Morpho Butterfly Farm where you can see theÂ Belizean Blue during every stage of their life cycle. Designed with local culture and environment in mind, El Monte Sagrado offers a splendid look at New Mexicos beauty. Â Offering hot air balloon rides, a spa, rafting and skiing you will not have a shortage of things to do. Enjoy your vacation in the trees, Daintree Ecolodge provides tree house accommodations in the Australian Rain Forest. Â Sustainability and local culture is a major focus for this resort. Green Pearls gives you the option to search for eco resorts as well as sustainable hotels. This company has lots to offer to help you find the eco friendly getaway you are looking for. A Company founded on the principle of customer service and (as it says in the name) responsible travel. Offering travel opportunities around the world! National Geographic offers tons of resources to help you plan that perfect eco trip, both on land and at sea. With a diverse group of educators and guides Small World Journeys offers a in depth view of Australia’s culture and unique wildlife. Baobab Travel offers the African experience with packages that fit any group of people and practice fair trade along with being signed to The Tourism Child Protection Code.